Natalis & Co. Hengstenberg & Co.
Frister & Rossmann was established in 1864 close to Berlin. In the 1880's the Company was awarded Medals at various International Exhibitions including Sydney, Crystal Palace, Amsterdam , London, Edinburgh, Adalaide, Melbourne, and Berlin. 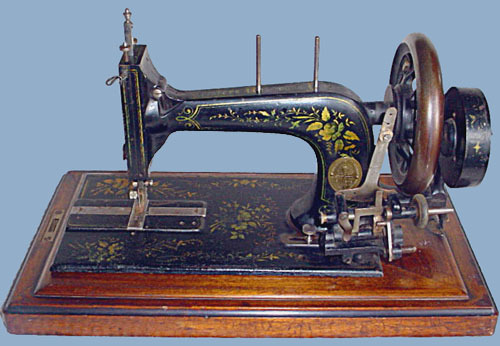 Frister & Rossmann became Germany's largest sewing machine manufacturer a position it held until 1902. In 1925 the Company was taken over by Gritzner who continued to produce machines under the Frister and Rossmann name. The Company started exporting sewing machines to England circa 1870 appointing an Agent in London to act as Wholesaler. However it wasn't until Hermann Loog took over the Agency from I. Nasch in 1876 that sales started to improve. Loog remained the Company's Agent until c1890, he was replaced by S. Loewe By Nov 1890 to c1898, followed by W. Pierssene c1899 to 1914 and finally O. Quitmann c1920 onwards. In addition to these Agents Frister and Rossmann sewing machines were also sold by "leading Drapers and Stores", one such store was Harrods. Frister and Rossmann. Serial No. 501846 ¤ 264846. Manufactured around 1878, there's no Agents name on the badge, round the outer edge it has Frister & Rossmann Shuttle Machine, in the centre of which it has F&R, 28 London Wall, London. The address should infact read 128 London Wall but the '1' has been obliterated by the pin fixing the badge in place. This machine would have been sold by Hermann Loog. It has Mother of Pearl inlay - 2 small "flowers"at the shuttle end and a further 2 with a "shield" in the centre of the bed. On the spoon of the bobbin winder it has the letters DRP followed by a Serial No. Although this machine does not have a Serial Number it is an interim model which shows the development of Frister & Rossmanns' Class 12 machine into the Class 48 machine. It shares features from both the earlier and later models, note in particular the slide plate arrangement and the area at the end of the arm which are the same as the fiddlebase machine. 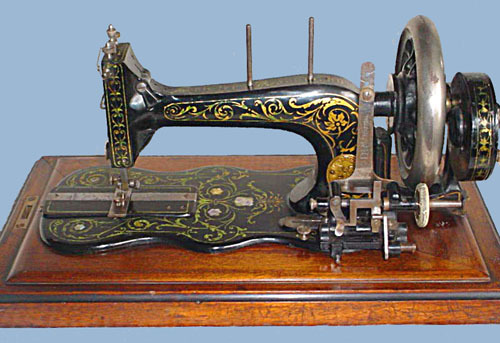 The Agent was S. Loewe, 49 Fore Street, London and given the early features we would think this machine was made around 1892. Although worn the Rose design decals are different from those usually found on Frister & Rossmann machines. This machine was in dreadful condition when purchased and came with an incorrect base for which we had to source a replacement. See pictures of the restoration. Frister and Rossmann. Serial No. 688217 R413217. A development of the interim version made around 1894 with an additional inspection port covered with Needle Size Plate. The agent was again S. Loewe 49 Fore Street London. Decals on early Frister & Rossman machines do not seem to survive well & those that do seem to turn green! The bed is decorated with a Mother of Pearl and there is an inlaid ruler in the base. The bobbin winder has DRP 12784 which is a German Patent Number. Frister and Rossmann. Serial No. 755871¤470871. Dating from around 1897 it is a development of the above machine. There is an additional slide plate and the arm has changed. The corners of the bed are sharp not rounded as with later machines and there are two small notches in the end of the bed to accommodate a treadle belt. The bed is decorated with a Mother of Pearl 'snowflake' inlaid design. The machine has a 'spoon' bobbin winder. There is an inlaid ruler in the base. The Agent was again S. Loewe. High Arm Family Manual c1897 - c1910. Frister and Rossmann. Serial No. 928790. Nice example of the Transverse Shuttle machine made around 1901. The inspection port on the shoulder has been deleted removing the need for the needle size plate. Frister and Rossmann.Serial No. 1096045. This machine probably dates to around 1903. The gold Leaf decals are only 60% complete but it is an example of its type. We find it interesting that there is a part of the mechanism 'working' outside the case at the back of the thread take up cam. This version has an improved bobbin winder. Frister and Rossmann. Serial No. 1378097. Dated around 1907. The attachment compartment is in the base instead of a box in the case. The decals are nice and bright. The Agent again was W. Pierssene of London. Frister and Rossmann Model K Serial No. 1673716. Dated to the early 1920's. It has delicate red flower decals and has the white porcelain handle typical of the German machines. Originally supplied by O. Quitmann of London. It came with its manual and a range of attachments. Unfortunately the base it came with was beyond saving and was not, in any case the original, as it was for a machine with socket hinges that had been adapted. Frister and Rossmann Model E Serial No. 1681625. Model E Vibrating Shuttle machine supplied by O. Quitmann, 18 City Road, Finsbury Square, London. The Decals are in excellent condition and it came complete with original manual. This machine would date around 1927. It was donated to our collection by a local couple. Frister and Rossmann Model E Serial No. 39722. Another Model E Vibrating Shuttle except this example has a longer bed (note the distance between the needle-plate and the end of the bed). Supplied by O. Quitmann, 23/24 Little Britain, Newgate Street, London. This would mean the machine would date around 1937. Frister and Rossmann Model D Serial No. 149109. A Model D Transverse Shuttle machine supplied by O. Quitmann, 23/24 Little Britain, Newgate Street, London. The date 27th Okt 1937 is stamped on the bottom edge of the case and we believe this would have been the date of manufacture. It seems strange that the company continued to produce such a machine which by that time was outdated in comparison with the vibrating shuttle machines then being produced. The machine takes a boat shaped shuttle which has been redesigned to take the bobbin through the end. One end plate of the bobbin has five holes through which the under thread can be passed to give different tensions. The decals are in reasonable condition although the bed is pitted in places. Note the spool pin this was designed to stop the reel of thread riding up the spool pin.